Reflex Vision is a tiny application that mimics Apple’s MacOS X Exposé almost exactly. It is a designed application for Windows XP that makes switching windows faster and easier. 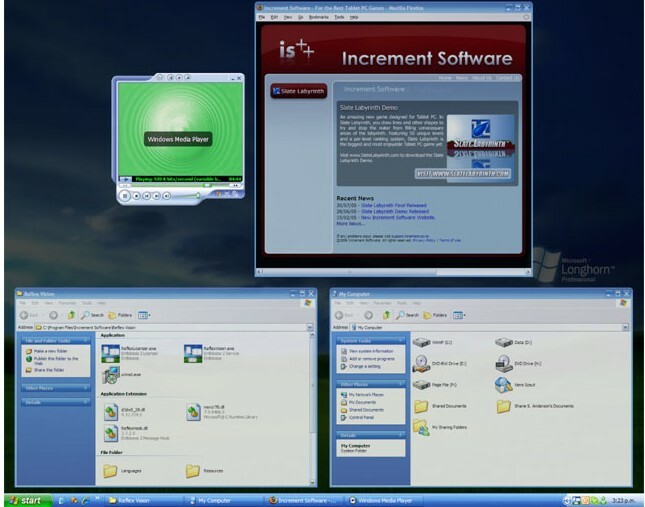 When this Window Switcher is running, you can reposition all opened windows and see them simultaneously by pressing a pre-defined hotkey or hotspot. You can then switch to the one you want by clicking on it. By using this function, it gives convenience to users to change windows more easily and quicker. This application is not free. It costs US$9.99. Besides the above function, Reflex Vision also allows you to have live previews on window changes. When a window changes its content, this program will update its preview and give you a more accurate choice of windows. Other functions of this application include the ability to enhance interaction with opened Windows, customize your windows, etc. Try out the demo available from Reflex Vision.